One day, immediately after Hugo purchases an expensive book from Max, the bookseller is kidnapped right in front of Hugo’s eyes – he just disappears. Hugo tries to get the local police involved, but then it seems that other witnesses tell different tales and the case is dropped. So taking a vacation from work, Hugo enlists the assistance of some friends, Tom Green, a half-retired CIA agent, and Claudia Roux, a journalist. The three of them start checking things out (while Hugo and Claudia also check each other out) only to find that years ago Max had been a Nazi hunter. 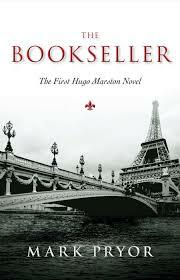 After a bit of investigation (breaking in) Hugo finds that Max’ s apartment has been ransacked – for the books. He calls Claudia and that turns into an invitation to dinner – at her family mansion, a talk with her father and a padded few dozen pages. I suppose it could be interesting – at least, thanks to his diplomatic employment, Hugo knows which fork to use and how to behave in this kind of public. There’s quite a lot of padding regarding the Paris sights, eateries, streets, etc. the French language. Pryor showing off his expertise/research? I don’t know – it seems to work and Hugo certainly enjoys Paris. And then other book stall owners start disappearing – or turning up dead. And their bookstalls change hands very quickly. The US Ambassador tells Hugo about the SBP, a labor organization which should be taking care of the booksellers issues – Hugo is warned off the case. Now comes the information about a foot-cutting gang, the import street drugs and cop-killing in France. What is this story getting into? Bottom line – it works and I’ll probably be looking for the next in the series.